Searching for a fun and easy way to explore Ocracoke Island? Look no further than Wheelie Fun Carts! Golf carts are a fantastic way to get around town, sightsee or cruise to your favorite shop or restaurant. Whether you’re riding solo or have a large group, we can address all of your Ocracoke Golf Cart needs. Our wide selection includes both electric and gas carts in four and six passenger models. Our knowledgeable staff will assist you in finding the perfect cart, personalized just for you, at prices that are easy on your wallet. Cart rentals are available by the hour, by the day or by the week with flexible delivery options. We will bring your cart to your rental house or hotel, or you can park and take off for sightseeing! And if you are flying into the tiny Ocracoke airstrip, we will pick you up and deliver you back at the end of your rental. Reservations for your Ocracoke golf cart rental are recommended, but walk-ins are always welcome. 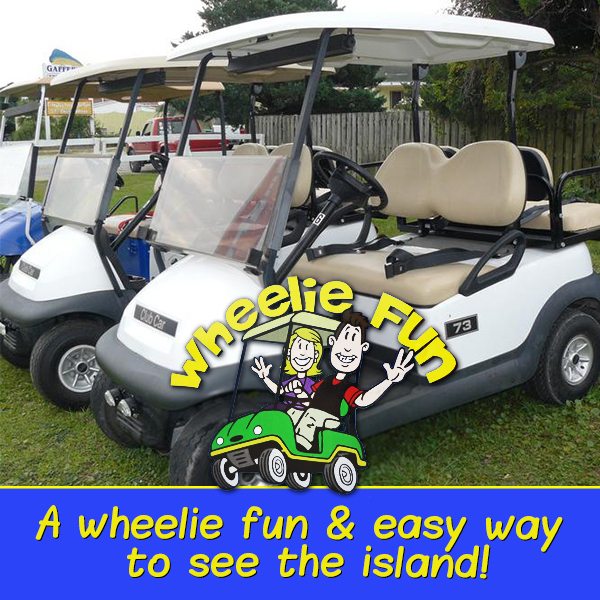 Locally owned and operated, Wheelie Fun Golf Cart Rentals is run by a friendly family with a wealth of knowledge about the island. Ocracoke is our home and we have family ties dating back generations. We are happy to share our thoughts on where to go & what to see and do! Next time you are on Ocracoke, please stop in and see us. We strive to be your one-stop shop for Ocracoke golf cart rentals and we look forward to meeting you! We are open daily from 8:00 am - 6:00 pm though we are happy to work around your schedule. Reservations are welcomed for daily and weekly rentals.